For those interested in the artist Georgia O'Keeffe or in New Mexico natural beauty, a visit to the Ghost Ranch in Abiquiu will provide you with an opportunity to enjoy the landscapes that Georgie O'Keeffe painted. Ghost Ranch, an education and retreat center of The Presbyterian Church, provides simple housing, dining room and educational programs to groups and to the public. Elder Hostels, for example, are held at the facility. Aside from the housing at the retreat center, the property has Casitas that can be reserved. Open May to early October. $55 per person, per day for the first two persons, then meals only for the next three. The casitas are adobe structures that sleep 2-5 people in twin and bunk beds with wonderful views of the red rock mesas and proximity to Box Canyon Trail. 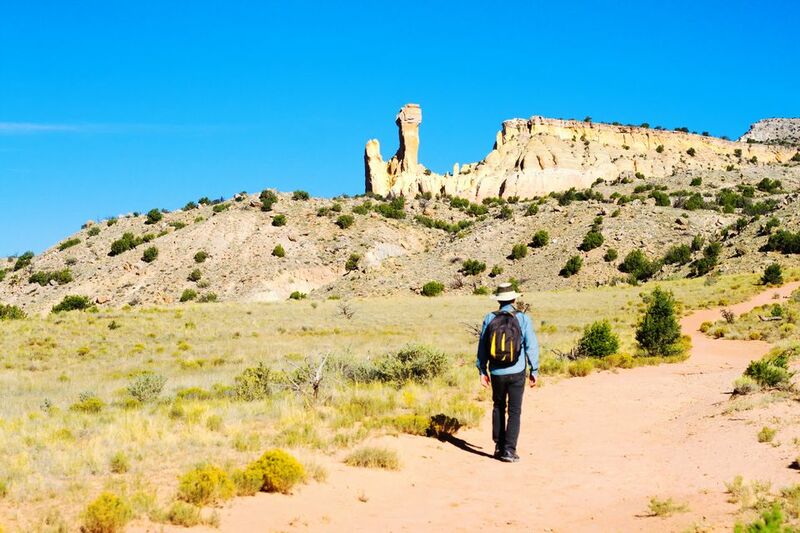 You can also camp at Ghost Ranch. Open from mid-May until early October the campground offers RV (hook-ups available)and tent camping. Unfortunately, O'Keeffe's Rancho de los Burros home at Ghost Ranch is not open to the public. You can catch a glimpse of it and of the Ghost Ranch burros, but you will not get close to the home. For a wonderful Georgia O'Keeffe home tour, make plans to visit her home in the village of Abiquiu. One of the highlights in any tour of O'Keeffe Country is to see the beautiful landscapes that she loved and painted. On the small van tour, you will stop at key sites where O'Keeffe painted and enjoy comparing prints of her artwork with the distant landscape. O'Keeffe fans can look out at the vast landscape and identify the red and gray hills, the red and yellow cliffs and Pedernal, the flat-topped mountain to the south. Tours are held mid-March to mid-November Tuesday, Thursday, Friday and Saturday, weather permitting. They depart at 1:30 p.m. The tour is approximately one hour long and costs $25. You must have a reservation. Call 1.877.804.4678, extension 0. Be sure and spend some time touring the grounds at Ghost Ranch. There are historic buildings, more beautiful New Mexico vistas and a nice gift shop where you can purchase Georgia O'Keeffe books and notecards. I purchased a Ghost Ranch cap there which always reminds me of my travels throughout O'Keeffe Country.